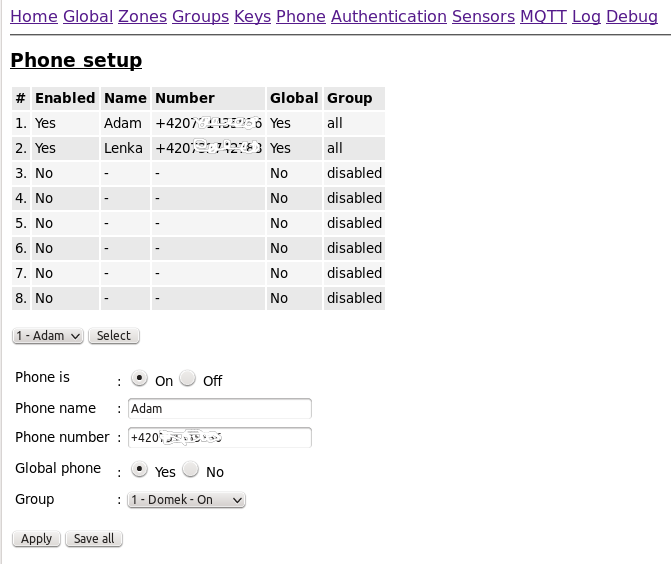 Web interface also include phone numbers setup. There is now space for 8 numbers. On the top you can see the overview in a table. Bellow there is selection button to chose to work with entries. Phone can be enabled or disabled, so you can temporary take anyone out. You can create unique name for every phone number for convenience. And it will appear by this name on other configuration pages. If you set "Global" option to yes the number will be informed about any event. As opposed to "Global No" the number will be informed only about group specified events. This page only specifies the setting for individual numbers, selecting which event will be passed is done in global configuration page.